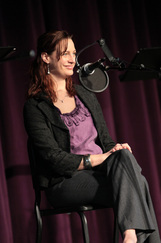 Jessica co-founded Lean & Hungry Theater in 2006. ​​​​Drawing primarily on the works of William Shakespeare, Lean & Hungry creates professional audio theater for the educational benefit and cultural enrichment. Ms Hansen served as Artistic Director for 10 years, growing the company's scope and vision to include live performances, broadcast on public radio stations nationwide, and an award-winning podcast.